Niall Moyna, Dublin City University manager. 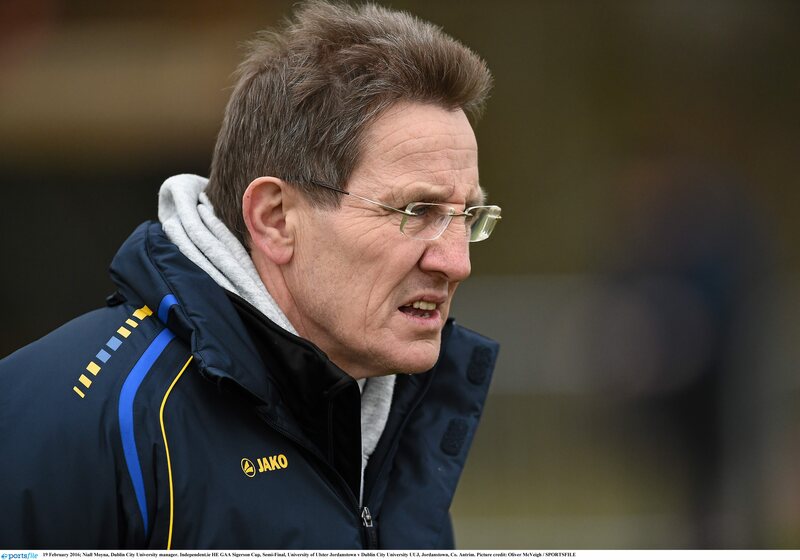 DCU Gaelic Football manager Niall Moyna has emphasised the importance of third level football to young GAA players aspiring to make the inter-county grade. The long serving manager reviewed last year’s GAA season as well as casting an eye on the coming year. Moyna and his DCU charges suffered a surprising defeat at the hands of eventual winners St. Mary’s at the Sigerson Cup Quarter Final stage. It took extra time to separate the two sides after an excellent second half performance that saw Enda Smith score two goals, but it was not to be for Moyna and DCU as they fell to a 2-13 to 2-14 score line at St.Clare’s. “The St. Mary’s game was an odd game, the game was dead and buried”, Moyna recalls. “Basically, if we had anywhere near the same cynicism as they had we would have won the game. But the boss was also quick to applaud DCU’s opponents. “You have to really hand it to Mary’s, they found a way to win it and we didn’t”, he said. “It’s becoming much more difficult in the last four to five years to get access to players, now it may change this year with the under 21’s going to under 20’s,” he said. “It’s extremely frustrating, not just for us because I’m sure it’s the same for all third level institutions, it’s becoming extremely difficult. DCU enjoyed a strong run in the league however, topping their Division 1 group and defeating St. Mary’s and rivals UCD on the way to a final that was narrowly lost to Ulster University. A mixed O’Byrne cup campaign saw DCU pick up an important victory over UCD but two tough games against Dublin and Wexford overshadowed the campaign. The Monaghan native and Professor in the department of Health and Human Performance believes that the structure of third level calendar may also change this coming year, although no changes have officially been confirmed. “I get the impression we’re not going to be allowed into the O’Byrne Cup this year, that’s what I hear through the grapevine, all colleges – and I think they’re going to play the Sigerson very early, that’s what I’ve been told,” he said. Although the university has lost quite a few senior players through graduation, Moyna is excited about the challenge of sculpting a new squad. “We’ve lost quite a lot (of players) but that’s what I find most enjoyable, it’s why I’ve never taken an inter-county job”, he said. “Every three years or every two years it’s a new team and it’s the challenge of moulding a team. “We won the last three freshers (championships), but it’s an enormous step up from Freshers to playing Sigerson and I think a lot of the Freshers players have got to realise that. The DCU manager is also slightly concerned about the mentality of some underage inter-county players. Moyna is now entering his sixteenth term at the DCU helm, he’s built several DCU teams, of which have lifted the Sigerson Cup an impressive four times during his reign. He has worked with countless inter-county and underage players but still stresses third level football’s importance.